Dental Crowns & Bridges – Restore Your Smile! Dental Crowns are a cosmetic restoration intended to improve your tooth’s shape or to strengthen it. 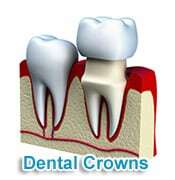 Crowns are most often used for teeth that are broken or worn, or have had portions destroyed by tooth decay. 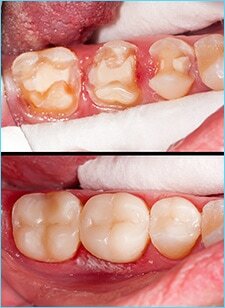 A crown is a “cap” cemented onto an existing tooth that fully covers the portion of your tooth above the gum line. In effect, the crown becomes your tooth’s new outer surface. Crowns can be made of porcelain, metal, or both. Porcelain crowns are most often preferred because they mimic the translucency of natural teeth and are very strong. Dental Crowns or onlays (partial crowns) are needed when there is insufficient remaining tooth strength to hold a filling. Unlike fillings, which apply the restorative material directly into your mouth, a crown is fabricated away from your mouth. Your crown is created in a lab based on your unique tooth impression, which allows a dental laboratory technician to examine all aspects of your bite and jaw movements. Your crown is then sculpted just for you so that your bite and jaw movements function normally once the crown is placed. Dental bridges “bridge” the gap created by missing teeth. 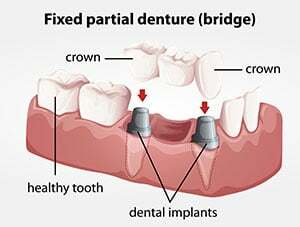 A bridge is two or more crowns for the teeth on either side of the gap — the anchoring teeth are called abutment teeth — and a false tooth/teeth in between. These false teeth are called pontics and can be made from gold, alloys, and/or porcelain materials. Dental bridges are supported by natural teeth or implants. For more information about Dental Crowns and Bridges and whether they are the right restorative solution for you, call us today (or use our handy form below). We’ll be happy to answer any questions you may have.